Brian L. Steed is an assistant professor of military history at the U.S. Army Command and General Staff College, Fort Leavenworth, Kansas, and a retired U.S. Army lieutenant colonel who served three times in Iraq. Brian L. Steed, Editor. 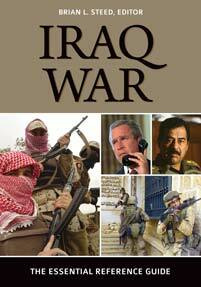 Iraq War: The Essential Reference Guide. ABC-CLIO, 2019. ABC-CLIO, publisher.abc-clio.com/9781440858314. This invaluable resource offers a comprehensive overview of the Iraq War, with more than 100 in-depth articles by leading scholars on an array of topics and themes and more than a dozen key primary source documents.